Title: The Terrifics #12 The Terrifics NO MORE! part 2. It’s been awhile since we had a chance to catch up with the Terrifics. Honestly, I thought the book was done at issue #10. The team had been cured of the dark matter connection and Metamorpho became his old self Rex again. Saturn Girl went home to BGZTL. 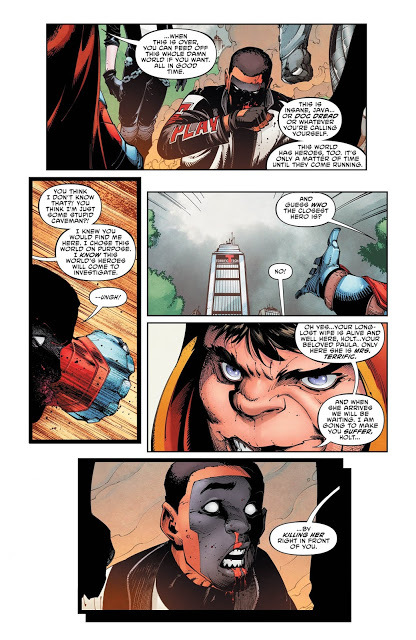 Mr Terrific was left to fight Java or Dr Dreadful. Issue #12 introduces the Dreadfuls in full. Jeff Lemire and Viktor Bogdanovic have created evil parodies of our heroes. This issue focuses on how each hero is dealing with their individual situations outside the hero group. Each character deals with their choices but then is more so opted to return to the team, which is a much bigger deal for Rex. He’s been Metamorpho so long that it’s strange for him to have a normal life with Sapphire. Bogdanovic’s art was hard for me to get used to. I thought last issue to be more cartoony if you will. I got used to his use of thin lines. I believe as an artist on this book one come up with some creative means of dealing with Plastic Man. His work could be a little more creative but Plastic Man is dealing with his paternal issues. It’s the more touching side of the story. This is a decent bridge issue to what’s to come. The final splash page was definitely worth the price as well. It’ll be fun to see if Lemire can keep this team together. Press Release: Karl Kesel and Tom Grummett return to Section Zero in April!